American earth weather satellite. Defense Meteorological Satellite Program. 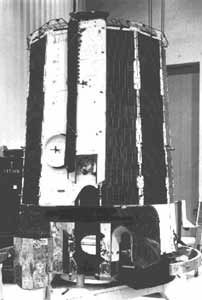 Meteorology satellite built by RCA Astro, USA. Launched 1974 - 1976. AKA: Defense Meteorological Satellite Program. Status: Operational 1974. First Launch: 1974-08-09. Last Launch: 1976-02-19. Number: 3 . Gross mass: 195 kg (429 lb). More at: DMSP Block 5C. Family: Earth, Earth weathersat, Sun synchronous orbit. Country: USA. Launch Vehicles: Thor, Delta, Thor Burner 2A, Thor Burner. Projects: DMSP. Launch Sites: Vandenberg, Vandenberg SLC10W. Agency: USAF. Bibliography: 2, 279, 6, 12234. 1974 August 9 - . 03:22 GMT - . Launch Site: Vandenberg. Launch Complex: Vandenberg SLC10W. LV Family: Thor. Launch Vehicle: Thor Burner 2A. DMSP-Block-5C F1 - . Payload: DMSP 9532 / OPS 6983. Mass: 195 kg (429 lb). Nation: USA. Agency: USAF. Program: DMSP. Class: Earth. Type: Weather satellite. Spacecraft Bus: DMSP. Spacecraft: DMSP Block 5C. USAF Sat Cat: 7411 . COSPAR: 1974-063A. Apogee: 844 km (524 mi). Perigee: 779 km (484 mi). Inclination: 98.80 deg. Period: 101.10 min. Defense Meteorological Satellite Program..
1975 May 24 - . 03:22 GMT - . Launch Site: Vandenberg. Launch Complex: Vandenberg SLC10W. LV Family: Thor. Launch Vehicle: Thor Burner 2A. DMSP-Block-5C F2 - . Payload: DMSP 10533 / OPS 6226. Mass: 194 kg (427 lb). Nation: USA. Agency: USAF. Program: DMSP. Class: Earth. Type: Weather satellite. Spacecraft Bus: DMSP. Spacecraft: DMSP Block 5C. USAF Sat Cat: 7816 . COSPAR: 1975-043A. Apogee: 880 km (540 mi). Perigee: 794 km (493 mi). Inclination: 98.70 deg. Period: 101.70 min. Defense Meteorological Satellite Program..
1976 February 19 - . 07:52 GMT - . Launch Site: Vandenberg. Launch Complex: Vandenberg SLC10W. LV Family: Thor. Launch Vehicle: Thor Burner 2A. FAILURE: Early booster cut-off due to incorrect calculation of the Thor fuel load.. Failed Stage: G.
DMSP-Block-5C F3 - . Payload: DMSP 11534/Star 26B S/N 009 / OPS 5140. Mass: 175 kg (385 lb). Nation: USA. Agency: USAF. Program: DMSP. Class: Earth. Type: Weather satellite. Spacecraft Bus: DMSP. Spacecraft: DMSP Block 5C. Decay Date: 1976-02-19 . USAF Sat Cat: 8696 . COSPAR: 1976-016A. Apogee: 361 km (224 mi). Perigee: 89 km (55 mi). Inclination: 98.90 deg. Period: 88.90 min. Defense Meteorological Satellite Program; unusable orbit. Last of the Thor Burner missions..
1976 May 22 - . DMSP 5C satellite F-31 was declared non-operational. - . Spacecraft Bus: DMSP. Spacecraft: DMSP Block 5C. 1976 December 9 - . DMSP 5C satellite F-29 was declared non-operational. - . Spacecraft Bus: DMSP. Spacecraft: DMSP Block 5C. DMSP tracking system was installed at Hickam AFB - . Spacecraft Bus: DMSP. Spacecraft: DMSP Block 5C. A tracking system was installed at Hickam AFB, Hawaii, that allowed Hickam to track DMSP satellites and receive data directly from them. The system was declared operational in June, and Hickam began functioning as a weather readout station in the DMSP system. 1977 December 1 - . Last two DMSP Block 5C satellites turned off. - . Spacecraft Bus: DMSP. Spacecraft: DMSP Block 5C. The Air Weather Service decided that it no longer required support from DMSP Block 5C satellites, and the two remaining Block 5C satellites were turned off permanently. This ended the Block 5C era..